Your journey through the wine regions and preserved coastal parks of Southern Australia begins and ends in Adelaide, a city teeming with art, culture, and dining opportunities. The first half of your trip takes you directly to wine country, first in the picturesque Germanic hamlets of the Barossa Valley, then on to the historic river town of Mannum, and then on to more vineyards in Robe, part of the newest official wine region, the Robe Wine Region. Halfway through your adventure, plan to spend two days exploring the amazing natural landscape of Mount Gambier, home of the famous Blue Lake, located in a volcanic crater. Then, it's off to Horsham, where you can explore Mount Arapiles and the renowned Horsham Regional Art Gallery. The last leg of your trip takes you back to wine country, in the town of Mildura, where you can explore the first winery of the region, Chateau Mildura. Stop in the historic mining town of Broken Hill, and then you're on your way back to Adelaide for some city fun. The Barossa Valley is the heart of South Australia's wine country. For more than 150 years the area has provided some of the best Shiraz in the world, along with a thriving arts and crafts industry. The Barossa Valley is home to quaint towns with stone churches, many of which remind travelers of Germany. There are numerous towns in the region; Hahndorf, Lyndoch, and Angaston and Tanunda to name a few. If an active endeavor is more your speed, drive a bit further and you will come to the Kaiser Stuhl Conservation Park, the Heysen Walking Trail, and the Mawson Cycling Trail. In the heart of the Barossa Valley wine region, this park features an Internet Cafe with wireless Internet, gas and electric BBQs, laundry facilities, children's playground, bathrooms for babies and also for the disabled, bicycle hire, and an information kiosk. Choose from cottages, ensuite cabins, park cabins, on-site caravans, van sites, and camping sites. Accommodations are completely self-contained, with refrigerator, cutlery, etc. Located at the start of the Barossa Valley, this award-winning park provides travelers with insider's advice on how to make the most of your stay in the region. While the park is limited on amenities (free BBQs, shelter with hot and cold water), shops, a swimming pool, and other necessities are within walking distance. Choose from a variety of powered sites: grassy, grassy with concrete slab, concrete slab, and gravel, as well as unpowered sites. The park also offers self-contained ensuite cabins with TV, shower, and air conditioning, and deluxe ensuite cabins, wheelchair access ensuite cabins, and self-contained units. With more than 50 wineries in the Barossa Valley, stopping by at least a few is a must. Many of the well-known vineyards are between Mount Pleasant and the Stuart Highway in the north, and there are numerous wine trails within the region, including the Barossa Cheese and Wine Trail. Learn about the history of the region and its German heritage at the Barossa Museum. This former 1865 Post Office features church furniture and other examples of woodworking craftsmanship, as well as tools, clothing, and other artifacts. A charming attraction for families, the Storybook Cottage and Whacky Wood is home to 55 displays of children's stories, fairy tales, and nursery rhymes, a wishing well garden, and a series of Australian bush games and puzzles. Don't miss the live animal area, where you can see 'Peter Rabbit'! Drive 83 km south and west (a little over an hour) to the riverfront town of Mannum. Located on the Murray River, Mannum is the birthplace of the Murray Paddlesteamer. Varied opportunities to enjoy water abound in around this town, from the river cruises, to the boardwalk, to the Mannum Waterfalls. Stop for a picnic at the Mary Ann Reserve, peek in a few antique shops, and explore the beautiful natural setting in this historic town. This next leg is longer than the first two days, but your 290 km drive south (about four hours) down the Limestone Coast via the Princes Highway will be a highlight of the day. The historic seaside town of Robe has something for everyone. Known for excellent dining, shopping, and beach bathing opportunities, Robe is also a town rich in history. Wander the scenic coastal walk, feast on crayfish, and then take a four-wheeler out on Long Beach. Explore the preserved beauty of Little Dip Conservation Park, which stretches from Robe to Nora Creina. Two-wheel drive access is allowed to Long Gully, but you can roam around on foot for 13 km along Nora Creina Road. Once the home of Aborigines, the area was set aside to preserve the surrounding lakes and the coastal sand dunes. Restored in 1995 and open to the public, The Old Gaol served as a prison from 1860 until 1881. Closed before completion (a section for female prisoners was never built), the outer. walls of the Old Gaol required steel boilerplate reinforcement after a series of escapes. There are two spectacular places to take in the seaside views, the newly constructed Beacon Hill Lookout Tower, and the Obelisk on Cape Donbey. Great photo opportunities! The newest official wine region in Australia, the Robe Wine Region was designated in 2006 (the region was formerly included in the Mount Benson Wine Region). Visit more than a dozen wineries, known for superb cellar sales and fun events for travelers and groups. The next leg of your journey takes you 131 km south and east (under two hours) via the Princes Highway to Mount Gambier. A thriving city built on an extinct volcano, Mount Gambier is a nature lover's paradise. Numerous lakes, parks, caves, ponds, and renowned public gardens could captivate you for days. The city is a recreational hub, and you will find much to do at the Crater Lakes complex that includes the famous Blue Lake, and at the popular Engelbrecht Cave. If outdoor fun is not for you, enjoy wandering through art galleries, shops, or continue your wine tasting adventure in the nearby Coonawarra Wine Region. With so much to do and a fantastic caravan park in the area, plan to spend two days. Truly unique to the Mount Gambier is the Night Lights Drive, a self-guided tour that takes a little over an hour to complete, but will be etched in your memory for years to come. Plan to set out at dusk from The Lady Nelson Visitor and Discover Centre (see below), where the impressively lit brig and full-size replica of the HMS Lady Nelson let you know you are on the right track. The next stop on the drive is the floodlit Umpherston Sinkhole, where you can see possums come out to feed, then on to Sexton's Cottage, a Gothic limestone structure. The rest of the drive takes you to a night view of Blue Lake, Centenary Tower, and up to Potter's Point for a great view of the city lights. Before the tour ends you will see several floodlit historic buildings, a fountain, and another floodlit cave. This impressive facility features exhibits on the history of the area, underwater life, fossils, and the wetlands before humans arrived. A 3D movie takes you back in time to the 1800s, a glass floor gives you a view of a cave typical in the area, and a neon volcano exhibit allows you to witness an eruption. A main focus of the Centre is the HMS Lady Nelson, and the exhibits dedicated to this sailing ship are fascinating. Don't miss the fossilized skull of an extinct kangaroo thought to be between 50,000 and 500,000 years old, which was discovered at a local cave diving site. Drive 219 km north and east (about three hours) via the Princes, Glenelg and Wimmera Highways (also Casterton, Coleraine Balmoral, and Horsham Noradjuha Roads) to Horsham. The capital of the Wimmera region, this thriving little city on the banks of the Wimmera River offers travelers 24-hour shopping, unique art galleries, and excellent golf greens. Explore the natural beauty within the city at the Botanic Gardens, or at one of the two national and one state parks nearby; Grampians National Park, Little Desert National Park, and Mount Arapiles-Tooan State Park. Located next to the Botanic Gardens, this park features river frontage, a lawn tennis complex, croquet greens, laundry facilities, library, and biking/cycling paths right in front of the park. Choose from river frontage sites, drive-through sites, and ensuite sites. Though the Council owns the park, it is privately managed. The park also allows pets. The Wool Factory was founded in 1983 to provide employment for people with disabilities. Today, it produces some of the finest wool in Australia. In 2004 the Wool Factory achieved a new world record for the finest bale of wool every produced. Located in an Art Deco building, the Horsham Regional Art Gallery is considered one of the most prestigious rural art galleries in Australia. Here you can view the collection of Mark Jost, a native of Horsham and world-renowned concert pianist, awarded the Order of Australia for his services to music and the arts. Formed in 1973, the Gallery is also home to more than 800 works of art by Australian photographers. The longest driving day so far takes you 312 km north (four hours) via the Henty, Sunraysia, and Calder Highways to the cosmopolitan town of Mildura. Considered the 'Mediterranean in the Outback Mildura is abundant in vineyards, citrus groves, and beaches. 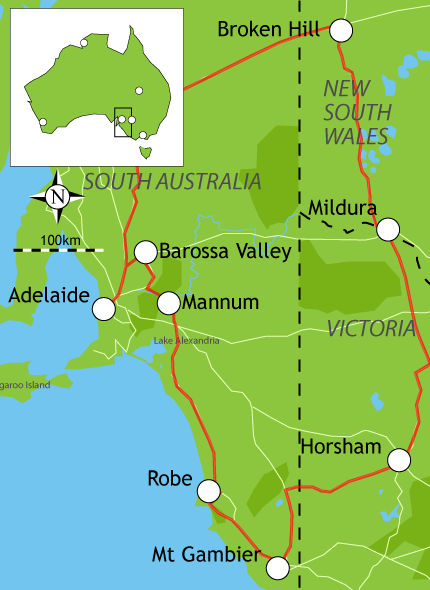 The town is the center of the Sunraysia horticultural region, which is the largest producer of citrus, dried fruit, wine, and vegetables in Australia. Located on the banks of the Murray River, Mildura has a flourishing arts scene, with numerous festivals throughout the year. The Mildura region is also known spectacular golf courses, and five national parks within a days drive. Located on the New South Wales side of the Murray River, the Australian Inland Botanic Gardens is like no other place on earth. Here you will find 2,500-year-old mallee eucalyptus trees, a rose garden with 1,600 plants, and more than 20,000 new plantings from Africa, Europe, Asia, North and South America, New Zealand, and Australia. Running through the Gardens is a 50 million-year-old river. Plans are underway to make the Gardens the gateway to the Barkindji Biosphere. Dubbed 'Australia's Most Famous Paddle Steamer', the Melbourne was built in 1912 as a workboat and restored in 1965 to carry passengers. The cruise, which has been running for over 35 years, features commentary from local guides, and offers lunch, snacks, and bar drinks. Make your way to the Mildura Wharf to check cruise schedules. See where it all began at the birthplace of the Mildura Wine Region, the Chateau Mildura. Established in 1888 when the Chaffey Brothers planted 150 acres of wine grapes, the Chateau is home to the Psyche Wines: Heritage, Psyche Smuggler, and Psyche Reserve. Stop in for a tasting and a bit of history, as you wander through the museum dedicated to the region and winemaking. Drive 298 km north (about 3 hours) via the Silver City Highway to Broken Hill. Known as the 'Silver City', Broken Hill is a mining community and you will want to experience that heritage. But do not overlook the many art galleries and museums. At night, Broken Hill is party central. A quiet park three km from the city center, this park features a camp kitchen, bus shelter, laundry facilities, bathrooms for babies and also for the disabled, children's playground, swimming pool, and gas BBQs for a fee. Choose from fully self-contained cabins, ensuite cabins, disabled ensuite cabins, ensuite powered sites and drive-through sites. Put on your miner's hat with its light and step into the miner's cage. It will take you down, deep into the earth, where former miners will guide you through a once-working mine. The road to Daydream Mine is not paved, but bus tours will take you there. The art section of this museum includes collages made of local minerals, which depict local scenes. You can walk right into the reproduction of a mine tunnel. A lively lecture will acquaint you with the history of Broken Hill. The final leg of your trip is the longest, 510 km south and west (just over six hours) via the Barrier Highway and the Main North Road back to your starting point. Because you will spend so much time on the road, and because there is so much to see and do in Adelaide, plan to take two days for this leg. Adelaide, the wine and festival capital of Australia, is vibrant, attractive and well planned, filled with colonial-style buildings. Enjoy a stroll along the main boulevard, North Terrace with its museums, galleries, and Tandanya - the National Aboriginal Cultural Institute. Adelaide is close to nature, fronting the ocean waters of Gulf St. Vincent, beside the River Torrens and surrounded by parkland and the Adelaide Hills. The most visited attraction in Southern Australia, the Adelaide Botanic Gardens was established in 1854 and now is home to several glasshouse conservatories. The Victoria House was imported from Germany in 1875, especially for the Victoria Water Lilly. Other glasshouses are the Palm House, and the Bicentennial House. Visit the SA Water Mediterranean Garden, the Botanic Park, Nelumbo Pond, the National Rose Trial Garden, and the Museum of Economic Botany. Return your campervan begin working on that scrapbook!